I'm an Assessment & Data Librarian in BC, Canada. 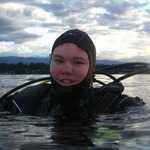 I'm particularly passionate about scuba diving, marine conservation, and MOOCs. Skiing the last degree: How do women adapt to the North Pole extreme conditions? Wonderful story. Thanks for sharing! Excited to see the results of this! Sounds like a great project. I'm looking forward to the results. The presence of Andy Lamb's Marine Life of the PNW on the lab desk and your commitment to getting undergrads Voodoo doughnuts totally swayed me. Go science! Maybe I've missed this somewhere, but I'm really curious how you're going to recruit your study participants. Do they have to identify themselves as having homo/bi/transphobic thoughts or actions?